Dubai, UAE – 25 February 2016: Emirates will launch a daily service from Dubai to Yangon (RGN) in Myanmar and Hanoi (HAN) in Vietnam, starting August 3, 2016. Utilising a Boeing 777-300ER aircraft in a three-class configuration, this new route will strengthen Emirates’ network of destinations in Southeast Asia, offer a new flight option to passengers travelling between Hanoi and Yangon, and open up new connections for Myanmese and Vietnamese travellers to access Emirates’ global network. This new service will expand the airline’s network in Southeast Asia to 12 cities (including Cebu and Clark in the Philippines which start on March 30, 2016) in seven countries when it comes online in August. Yangon is Myanmar’s commercial capital and largest city with a population of 7.2 million. Since the opening up of tourism in the country, Myanmar has continued to witness an increase in foreign tourist arrivals, in particular attracting those interested in eco-tourism or the country’s many historical temples. With its religious and ancient sites, natural trails and picturesque beaches, Yangon welcomed 1.1 million tourists in 2014, an increase of 25 percent compared to the previous year. As the country’s main hub for trade, industry, real estate and entertainment, Yangon contributes approximately one fifth to the country’s GDP. Hanoi, the Vietnamese capital, is located in the Northern region of Vietnam, and as second largest city in the country, has a population of 7 million. Hanoi’s economy has grown from strength to strength since the 1990’s, and this is evident by the number of industrial parks and clusters across the city. Renowned for being a cultural hub, the city has a number of historic attractions, as well as UNESCO world heritage sites like Ha Long Bay. Hanoi will be Emirates’ second passenger destination within Vietnam, complementing Emirates’ existing service to Ho Chi Minh City which was launched in 2012 and a cargo-only service to Hanoi in 2013. With the daily service to Yangon and Hanoi, Emirates, in cooperation with its regional codeshare partners such as Bangkok Airways and Jetstar – now serves the major capitals and tourist attractions in Southeast Asia, providing the opportunity for tourists in these markets to build travel itineraries covering multiple cities in these destinations. “With the opening of this service, Emirates will enhance its Southeast Asia offering and offer more choices for travellers in Myanmar and Vietnam to conveniently connect to 39 cities in Europe, 16 in the Middle East as well as a number of destinations across our extensive network in Africa and the Americas,” said Adnan Kazim, Emirates’ Divisional Senior Vice President, Strategic Planning, Revenue Optimisation & Aeropolitical Affairs. The three-class configured Boeing 777-300ER which Emirates will operate on the route offers 8 seats in First Class, 42 seats in Business Class and 310 seats in Economy Class. In terms of cargo, up to 20 tonnes of capacity will be offered in the bellyhold on this service. This is in addition to the 260 tonnes of cargo capacity each way on our existing weekly cargo-only service between Dubai and Hanoi. Popular exports on this route are expected to be manufactured garments and seafood from Myanmar, and marine products and electronics from Hanoi. Timings of the new service have been scheduled to allow for seamless connections to many European and GCC routes, via a convenient stopover in Dubai. Flights to Yangon and Hanoi will depart daily from Dubai as EK388 at 02:50hrs arriving at Yangon International Airport at 11:05hrs. The service will then depart from Yangon at 12:35hrs and arrive at Hanoi’s Noi Bai International Airport at 14:50hrs. The return flight, EK389 will depart Hanoi at 22:50hrs, arriving at Yangon at 00:20hrs the next day. The service will then depart from Yangon at 01:50hrs and arrive at Dubai International Airport at 05:05hrs. Passengers travelling on Emirates’ Boeing 777-300ER will be able to enjoy the airline’s award-winning ice system with up to 2,200 channels of on-demand entertainment to choose from. As with all Emirates flights, passengers travelling on the Yangon and Hanoi service will be able to take advantage of the generous Emirates baggage allowance of 30kg in Economy Class, and 40kg in Business Class, and 50kg in First Class. 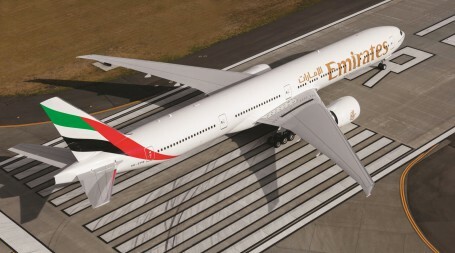 For more information about Emirates, please visit www.emirates.com.